JD Special C-Tex – my first tomato of the season! I have a confession to make. I’m obsessed with tomatoes. Every winter, I get all the tomato seed catalogs together and just drool over every variety, dreaming about how good they would taste. 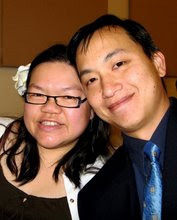 I’m also a member of Tomatoville, an online community of like-minded, tomato-mad folks who talk, share seeds, and even get together to celebrate their obsession. I don’t buy tomato seedlings from nurseries or hardware stores (they never have any interesting varieties anyway!) I get all my seeds from fellow Tomatovillians and start them at home. My tomato madness was so bad that, a few years back, I tried to grow over 50 tomato varieties in my very small urban backyard! I want to say though that the obsession has “matured” and I am not as crazy as I used to be; this year, I am growing only 32 varieties. Yes, it is a really great sacrifice on my part, I know. Back in April, Nate took us to the Spring at Guadalupe Gardens event, where Cynthia from Love Apple Farm was giving a talk on tomato growing. At that event, she had a booth where she was selling some tomato starts. That’s where I saw JD. JD Special C-Tex has been the talk of the Tomatoville forum this year. Everyone who grew him was just raving about how awesome the flavor was. And here he was, tall and vigorous and dreamy. Even though I had all the tomato seedlings I needed this year, when I saw that JD Special C-Tex tomato standing there all alone, I knew I had to get him. So, I pounced. I sneaked JD aside and placed him along with a few other plants I wanted (yes, I bought more–5 to be precise!). When Nate saw that I was bringing more tomato plants home, he looked at me quizzically, chuckled, and shook his head. But he let me take them. Well, since he brought me to the event, he should have known I wouldn’t be able to resist. He was feeding my addiction! We took JD home and Nate dutifully planted him. Good husband. Two months later, JD Special C-Tex was my first plant with a fruit to ripen. Let me tell you–it takes a REALLY long time for a fruit to turn from green to their ripe color (I won’t say red because tomatoes really come in all colors–that’s another post). But once they do change, it doesn’t take much time before they are ripe and ready to eat. I was very excited when JD turned a dark, purplish red. But I waited for FOUR WHOLE DAYS before picking it so the tomato would have time to get its flavors all packed in. Finally, I could resist no longer and picked it. It is a little on the small side for a JD Special C-Tex but it’s only the first so I’m happy enough with it. 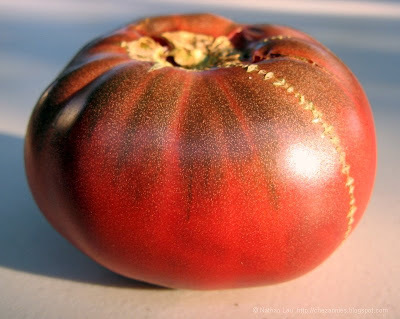 Doesn’t this tomato look luscious? Here’s how it looks cut crosswise. Look at all that meat in the middle. JD was looking more and more promising. Ok, here is where I have to tell you that I was almost reluctant to cut into JD because I had guests that night and this was my FIRST tomato and I didn’t really want to share. I didn’t even want to share with Nate or my two kids! But I really, really wanted to try him. So I decided to be nice and share. I cut JD into small chunks then sneaked my first bite right there in the kitchen. Oh. My. Gawsh. I seriously almost changed my mind about sharing–it was that good! But I had let out this loud moan of pleasure that everyone could hear so there was no way I could keep JD all to myself. So I brought out the bowl with the chunks of JD and passed them around. Everyone was very considerate and only took one. Suddenly, there were exclamations of surprise, wonder and delight as they bit into it. The bowl went around the group twice and then I let my daughter have the last two. And just like that, JD was gone. In a month, I’ll be inundated with more tomatoes. But JD Special C-Tex, you were my first love apple this year. You’ll always have a place in my heart and garden. 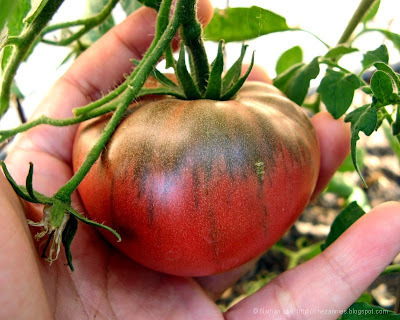 To make sure you grow the very best tomatoes, be sure to read my Top Five Tomato Growing Tips. I am from Florida and have 2 JD’s under my grow lights ready to go in my earthboxes later this month (anyone jealous?). See if it can compare to Brandywine OTV, Kelloggs breakfast, white wonder, yoders, Dr. Wyches,Marianna’s peace. Anyone tried Aunt Gerties gold yet? @Chuck – we are growing Aunt Gerties Gold and love it. Great flavor. We’ve tried everything you mentioned except Yoders, and I’ve found JD’s Special C-Tex to be better than all of those (but remember, taste is subjective, and plants vary year to year). Well every plant was set out in my earthboxes on Set. 22nd and both J.D special plants are loaded with fruit. My Yoders, Dr. Wyches, white wonder, have the biggest fruit and plenty of them and now just waiting to see which one ripens first. I will not count my early girl improved or Juliet in this contest for Juliet is a few days away and early girl about a week. @Chuck (?) – so jealous of your 2nd season! Okay! 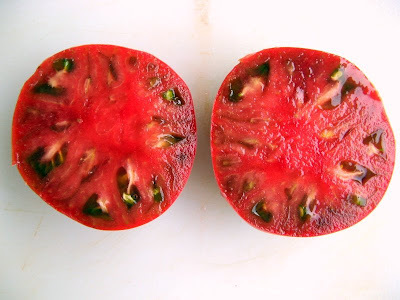 I ate my first Pomodoro variety tomato from seed from Italy and it blew me away. Then I ate a few days later an improved early girl and have to say it was simply wonderful. Just last night after waiting an extra 4 day’s for my Dr. Wyches to develop the flavor on the vine I ate it at 1 a.m. This was due to a bird that pecked at it. I was also amazed at the flavor and to me every bit as good as Kelloggs breakfast. I have a large J.D on the vine in the 1 lb. range close to being ripe. This is the one I am so curious about. I will let you all know how it is. Has anyone ever heard of a tomato called Bianca Grande? it is supposed to be the best white tomato ever and like cotton candy!! I have it under the grow lights now along with 16 other new ones never grown by me before. The flavors of my tomato’s this year seem to be better than ever for some reason. They are all being grown in earthboxes except for 1 white wonder and one Brandy OTV. P.S Glad you liked Aunt Gerties Gold. I have 2 under the lights and have heard from most that it is the best orange ever. I have still not had my Yoders, but very close!!! @Anonymous – better, huh? Are you using a different seed source, different fertilizer, different growing technique? My Dr. Wyches is being grown in an earthbox which is a controlled growing area. In South Florida it is hard to get flavor out of tomato’s, especially the blacks. By the way I had two J.D specials and the first one was good, second was average. Ihad two other tasters and both thought the Dr. Wyches was better. I am sure it is the climate for I have heard nothing but great about that black. I do have seed saved for next time. SWIFT Theme by Satish Gandham. 55 queries in 0.958 seconds.